The Westcountry Rivers Trust is creating new salmon spawning habitats by adding gravel to rivers in Devon and West Somerset. Funded by South West Water, as part of the National Environment Programme, the project aims to increase the number of salmon and trout by creating gravel beds, which these fish need to build nests for their eggs. Hundreds of tonnes of granite gravel have now been added to sections of the River Avon and River Teign on Dartmoor and the Haddeo on Exmoor in Somerset. 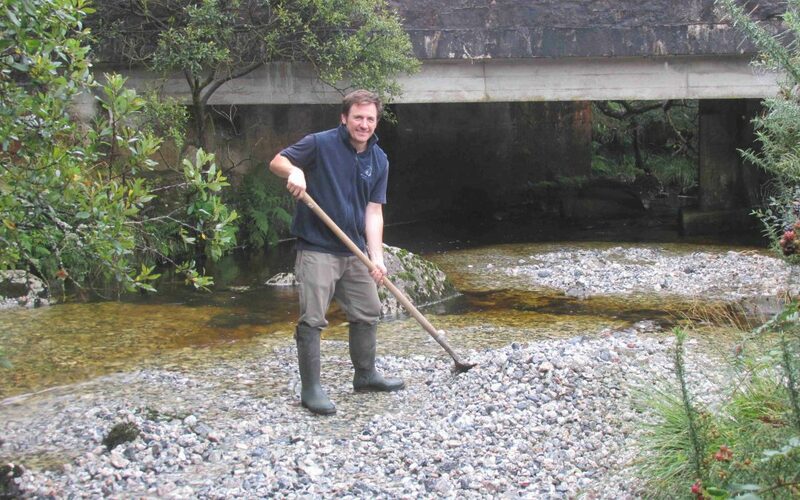 Along with researchers from Plymouth University, the Westcountry Rivers Trust will monitor the movement of the gravel along the river as well as comparing the numbers of salmon and trout with previous years. Many rivers have lost their natural gravel beds because of obstructions, such as dams or weirs. These barriers prevent rocks and stones from travelling down the river, which has led to a shortage of spawning sites for salmon and trout. The team has now added 400 tonnes of gravel to a 2.5mile section of the River Avon, near Shipley Bridge. Similarly, gravels have been added to over half a mile of the River Teign, below the South Teign as well as to a stretch of the Haddeo on Exmoor. The team was on a tight deadline to get the new gravel into the river in plenty of time for the spawning season. Adult salmon lay their spawn in freshwater gravel beds, known as ‘redds’, in the autumn and the eggs hatch in the winter. Matt Healey, Land and Fisheries Officer for the Westcountry Rivers Trust said: “Gravel beds are essential for salmon and trout to spawn. They seek out these habitats to cut redds because when water travels through the gravel it carries oxygen to the eggs, which they need to survive. If there isn’t enough gravel, then there is limited spawning opportunity, and if there is too much silt in the gravels the eggs become smothered and don’t survive. These gaps between the stones also help create environments for invertebrates, providing food for the fish. By adding stones of different sizes, the Westcountry Rivers Trust aims to make the new habitats as natural as possible. Plymouth University researchers are electronically tagging some of the stones, so they can monitor how the gravel moves over time. This research will help scientists understand how far the stones move, and where they settle, to assess how successful the project has been in creating spawning habitats.